When my phone rang, I jumped out of bed. It was 4am and my colleague P was on the phone. ‘We’re downstairs’. ‘OK, I’ll be down soon’. I didn’t hear my alarm clock go of. Did it? Anyway, it was too late to process all that right now. I dived under the shower, brushing my teeth as I went along. In 3 minutes, or 5 I was ready to catch the shut-eye flight to London. In the car my colleagues didn’t sense at all that my boast of the day before that I would be up, legs crossed, sipping a cup of tea and waiting for them…was just that, a boast. We’d all laughed at who would still be asleep when the taxi came – and it was me. 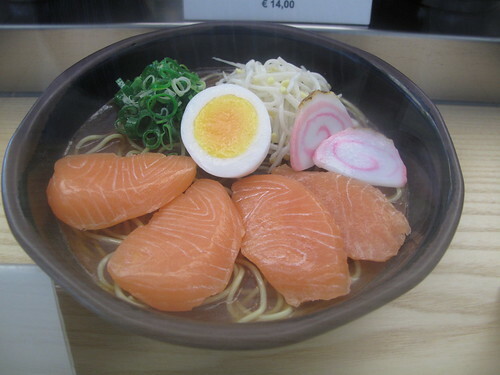 We arrived at Schiphol and while waiting to check in, I walked past a Japanese food stand, whereupon I was confronted with my first ever bowl of ramen. As in the first bowl I ever really noticed, complete with the pink-centered fish slice. Though I didn’t get a taste on that morning two years ago, I took the three photos below. And never told my colleagues I overslept. And so with Japan on the list and Momofuku’s cookbook in hand, the choice was easy; easy but not at all a short journey. 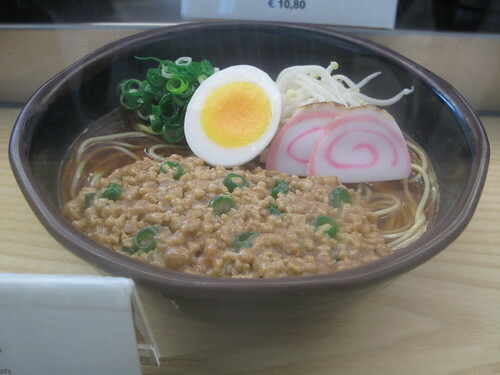 Read on for my ‘Traditional Japanese dish’. Welcome to the 2011 Culinary Tour, organised by Joan of Foodalogue. Traditional: make one of the country’s national or traditional dishes. Contemporary: take a traditional recipe and contemporize it. Or, using the flavors and techniques of the country we are visiting, create your own recipe. 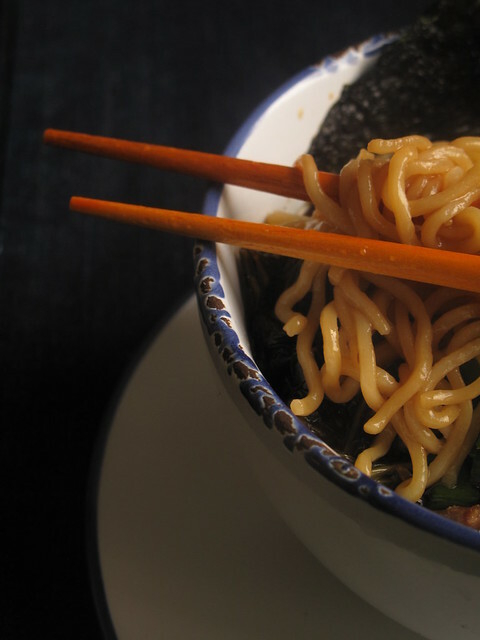 In this great treatise on Japanese-Korean-Fusion food, the Ramen recipe covers 17 pages. For my sanity….and yours, I have not reproduced a single recipe. Instead, I have written a journal of the week with links to other blogs where the various components of the recipe have both ingredients and method written up. 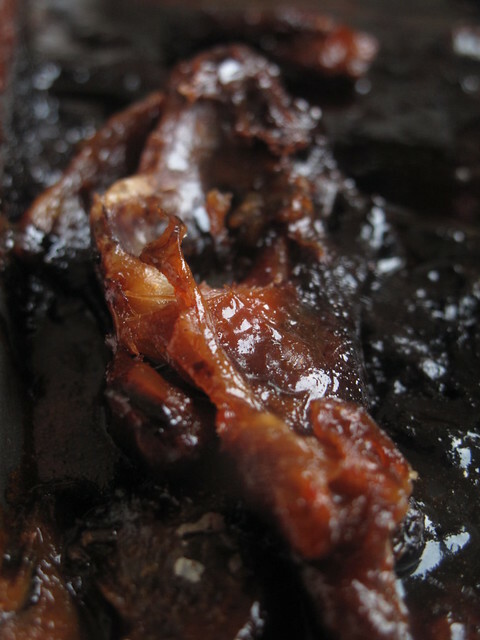 A like mind saved the pork bones from his shoulder to make the stock. Fish cakes aka naruto – I couldn’t find them. Sniff, sniff. To make the broth, David writes: ‘Rinse the konbu under running water, then combine it with the water in an 8-quart stockpot. Bring the water to a simmer over high heat and turn off the heat. Let steep for ten minutes. Remove the konbu from the pot and add the shitakes. Turn the heat back up to high and bring the water to a boil, then turn the heat down so the liquid simmers gently. Simmer for 30 minutes, until the mushrooms are plumped and rehydrated and have lent the broth their color and aroma’. I wondered about the magic behind these steps. As far as I was concerned, it was a waste of time. Apparently, I wasn’t the only one with that on the brain. Catastrophysicist says ‘I’m about following recipes they way they’re written the first time I do them, so I followed this bugged out criteria that called to bring two sheets of Konbu (dried seaweed paper) to a boil then to let it steep for 10 minutes, before I took those out, and put in two cups of dried shiitake’s, brought it back up to a boil, and let it simmer for somethink like 30 minutes, before I removed those and put a whole chicken in the pot and let it poach for an hour. If someone knows and can explain the logic of doing all this in stages and would like to share their knowledge, I would be pleased to receive it! In the future, I’m a just put all that **** in the pot at the same time and save myself an hour of pot-watching’. And then I read this post from Tiny Urban Kitchen who attended a lecture given by David Chang as part of the Science and Cooking Lecture Series at Harvard University. 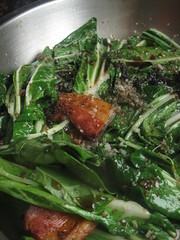 He said that ’60 °C is the perfect temperature at which to cook kombu (kelp). 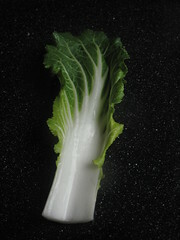 It brings out as much umami as possible without extracting too many bitter compounds’. A-ha.Lightbulb. Lightbulb. Lightbulb. So the gentle simmer and sitting out after a 10 minutes steep was to heighten that pleasant savouriness of the 5th sense. Who am I to complain? To discard or not to, that’s the question. Well, not really for me. Step 6 deals with both chicken and bacon leftovers. ‘Remove the chicken from the pot and add the roasted bones to the broth, along with the bacon. Adjust the heat as necessary to keep the broth at a steady simmer; skim the scum and replenish the water as needed. After 45 minutes, fish out the bacon and discard it. 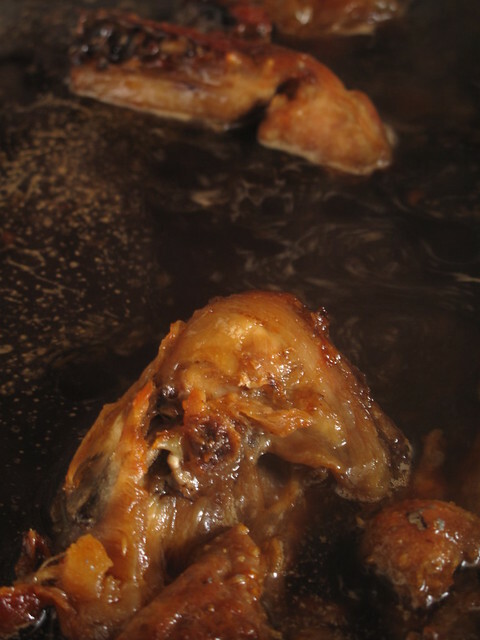 Then gently simmer the pork bones for 6-7 hours–as much time as your schedule allows. Stop adding water to replenish the pot after hour 5 or so’. David doesn’t say what to do with the chicken – I found it the perfect opportunity to make ‘pulled chicken’, to go with tortillas, homemade salsa and peacamole. And the bacon, I didn’t discard as directed. Instead, I fished out the slab, rinsed it and let it rest in the fridge. The morning after, thick slices were cut off and pan-fried – very delicious, just the right amount of salt and perfect to eat. Ensure you rinse the salt and sugar off the pork belly and shoulder after the overnight rest – the recipe doesn’t say it but I think the meat would be too salty otherwise. Do not leave it unattended – it can end up a sticky mess. As I learnt. This soup started life as a list. Ingredients cobbled together from Momofuku’s recipes. 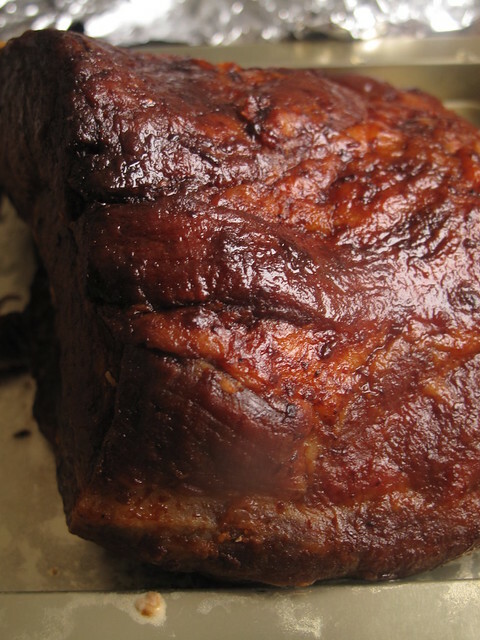 Chicken for the tare and pork belly for the ….roasted pork belly recipe. 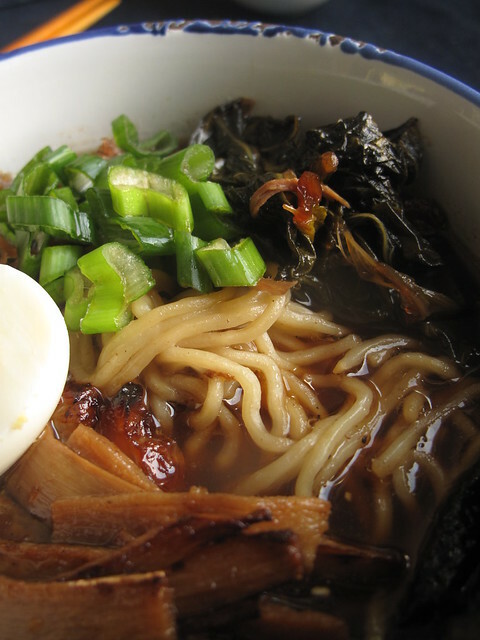 Ramen, naruto, spring onions and ginger. Konbu. A long list. After a full day shopping and cooking, I start on the broth. I don’t have konbu and so I substitute black fungus. I have no dried shitake mushrooms so I use a forest mélange from France. It simmers, a bubble occasionally breaking the surface. In goes a whole chicken sans legs, thighs and back. 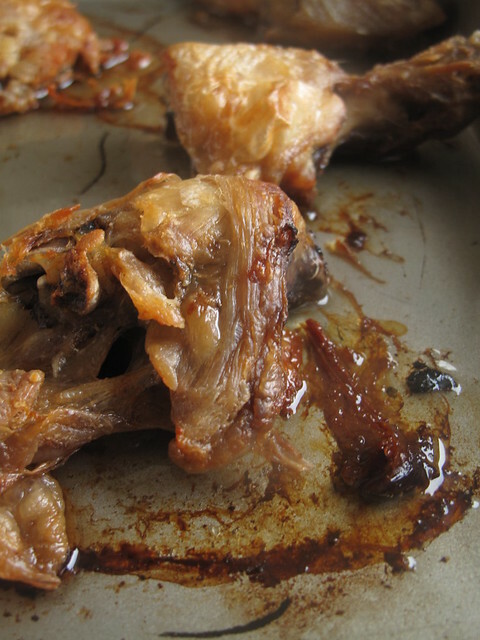 The fore-mentioned appendages roasting with chicken wings – one side for the week done. And the back, chopped up in three, lies on another baking tray, roasting for the tare. And that was the end of the first day – the taré, half complete with the roasted chicken bones goes in the deep freezer, along with the broth, cooked halfway with the chicken. I have had two days to ponder. I re-read the recipe; just to be sure I’m on the right track. Scheming and planning, I think of how to combine processes so it takes half the time, I expend half the energy and I save myself a lot of cooking gas in the process. I bring out the pork belly and the pork shoulder from the deep freezer. I set them in a bowl, in the fridge to lose their freeze. And then I sit down and hurry to write about my Turkish adventures. It is midnight before I go to bed. Sleep comes easy and then the next day begins. The crusade of the pig is on. 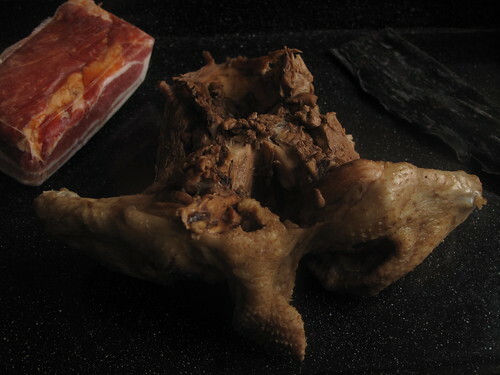 The animal parts are washed, dried and rubbed with a mixture of sugar and Les Salines de Guérande, from the marshes of France. Twice a day, during the high tides, water from the open sea flows into the marshes… The salt worker opens a valve to give it access to the primary pond (“vasière”). Then, the sun, the wind, and the salt worker’s expertise evaporate the water until the salt finally crystallises in the crystallisation ponds (“oeillets”). I return the meat parts to cooler climes, leaving them to season themselves. I wake up and rinse the soaked crystals off the pork. 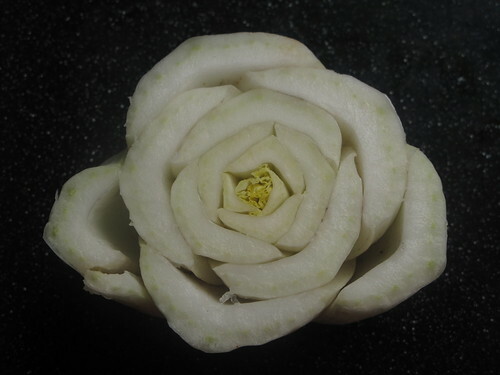 It returns to the refrigerator – to be tended to soon. Today is Thursday, it’s late night shopping, yay…stores stay open till 9. I’m excited. I get to go search for the other ingredients and then go for a book reading with two female authors, sharing their painful memoirs. Caroline is a black American living in the Netherlands, her book is called ‘Black and (A) broad‘. Niamh is Irish and a singer. Her words come together in ‘The Singing Warrior’. But first there’s work. And then there’s winkelen (shopping) and then the book reading. All in that order. 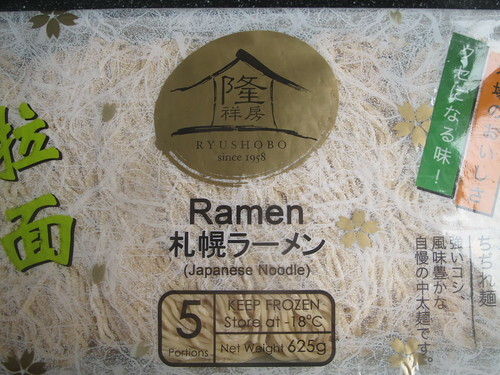 Shopping is fine, I get some konbu and frozen ramen from the freezer section of the Oriental shop. I search for stainless steel chopsticks, eager to include them in my photo shoot. I don’t find any. Just as my search for naruto, the cylinder of packed fish with a nice pink swirl turns up nothing. The temperature must be sub-zero – my sockless feet are frozen in my red pointy shoes. But still I insist of heading to Chinatown to look for my Japanese fish. Am I surprised when again I draw blanks? I call it quits, wandering if perhaps I should make mine. In good time, I catch the red and cream tram and get off at Dr Kuyperstraat. I wait for the traffic lights all the while thinking of my pulled pork that is still one lump of shoulder flesh. Sigh. The book reading is fun. Full. I’m astonished, so many people wanting to celebrate the courage of these women who bared their hearts and showed up for themselves. I ask Carolyn one question. I have read her book – a Christmas present from my husband. ‘When you woke up all those mornings at 6am to write for half an hour, as prescribed by ‘The Artist’s Way’, did you type on the computer or handwrite?’ She replied ‘I wrote by hand’. And I smile. Back at home, I’m too tired to do anything else and again, sleep calls. I’m excited beyond words. Finally I get to progress with this recipe. The pork belly goes in the oven. Caramelises and then cooks on low. And into goes the shoulder. An hour later, belly is done, cooked, partly confitting in its own fat. It comes out of the oven to rest, the fat decanted into a jar, while the shoulder cooks on. When the pork belly is cold, I cut a slice. I am stunned at just how good it tastes. Wow. Who would have thought simple sugar and salt would create such caramalised goodness, worthy of only the tastiest ribs. The pork shoulder will take forever to cook. When we head to bed at midnight, it should be ready. Ready for me to continue my broth tomorrow morning, for the recipe calls for roasted pork bones. 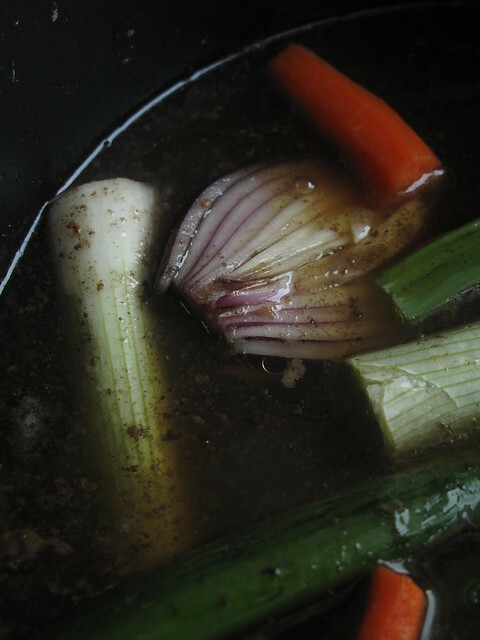 Now, being the clever beaver that I am, rather than separately roast meaty pork pones, I will slice off the bony base of my shoulder….and use that to finish off the broth. But that’s a task for tomorrow. Today, right now, I must venture out into the dark – braving arctic temperatures all in a bid to bring out the red rectangular bowl containing the half completed broth and the roasted chicken backs. Our friend from London stares in shock as I show her the 17 pages the recipes occupy in the Momofuku cookbook. She can hardly wait till Sunday to tuck in. Soon. Today, the Girl’s scouts are helping out at a school event. As a leader, I have to report there, garbed to lead my girls. But before all that, soup is king. And it is winter. I set my broth to simmer. It needs 5 – 6 hours and I will not have myself standing around a pot. 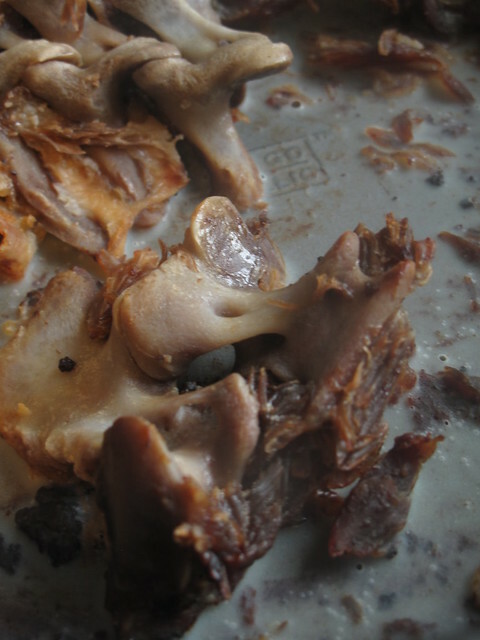 So in goes some (should have been bronzed) pork bones….a little flesh hanging on. 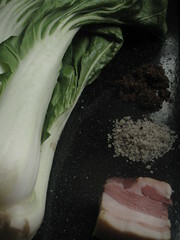 And then I get started on the taré – mirin, sake and usukuchi (light soy sauce). The thing about multi-tasking is…..occasionally, something will go wrong. And this time it was my tare – it bubbles away on low heat while I go upstairs, leaving it unattended even thought the husband and friend are in the kitchen. I go up to get ready for my outing. I take much longer than anticipated. I smell it before I see it…..it is meant to be a reduced liquid but instead, I have some thick syrup. The thing about multi-tasking is you must steady yourself in case things go awry – shrug your shoulders, see what you can salvage, pray to do better another day and most importantly, carry on. 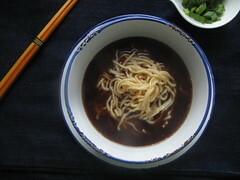 I could save a tiny amount, I compensate for the loss by putting the tared chicken bones into the broth. Finally, I get the girls and boy out of the house and off to do our duty to society, helping out at a musical event. At 2.30, the husband receives a phone call from me saying ‘please top up the broth with 2 cups of water, use the children’s cups’, I said. He says back ‘but there’s still a lot of water left’, and I reply ‘I know’. And then I remind him to turn it off at 3. He knows that already. So I’m safe. At 4.43pm I sit down to write today’s entry. Since our return home a few minutes ago, I’ve peeled an onion, cleaned a few carrots and sliced some spring onions. They go back in the pot to the sound of Dutch television – my children’s faces glued and their mouths moving to the rhythm of crunchy cookies. I will begin with the bamboo shoots next. So that tomorrow can be all about assembly and eating. Nothing to interfere with the culmination of a week’s work. Our friend visiting from London is aghast with shock. Wonder and amazement. ‘I can’t wait to eat this tomorrow’, this journey of a week’. Seasoned veggies are prepared and left to cool off at room temperature. 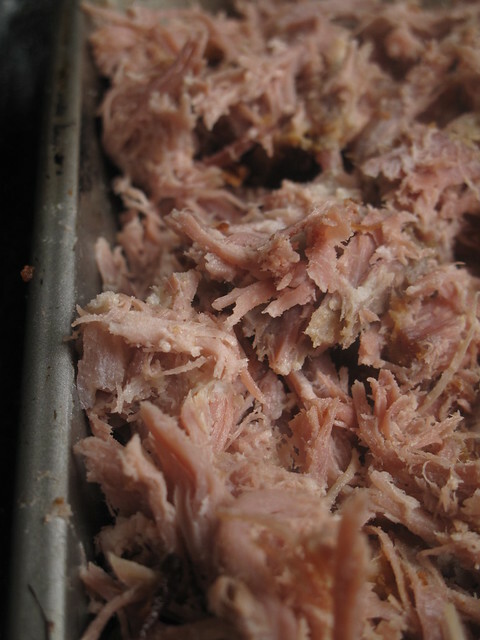 Pork shoulder turns pulled and fills a small baking tray. Everything goes perfectly. I follow David’s advice to heat up everything before we eat – the bowls go in the oven with the pulled pork. 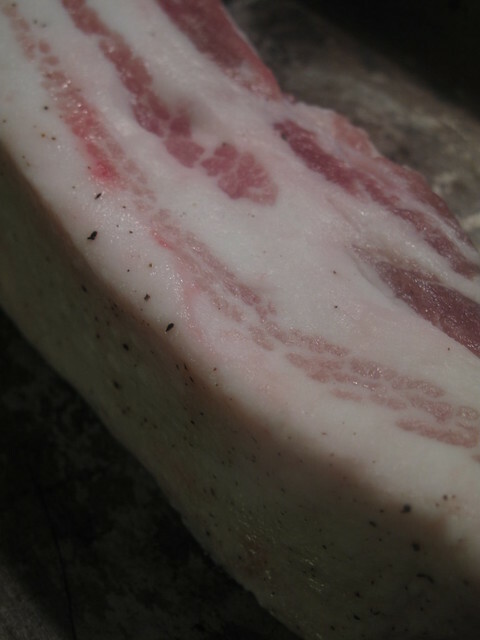 In a pan, strips of roasted pork belly are lightly warmed up. Shimmering green flame-toasted nori squares sit carefully in a pile, waiting for their turn in the bowl. 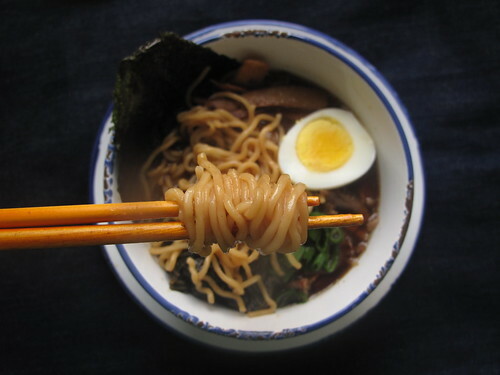 Ramen noodles are boiled, drained and the broth…..seasoned with taré is ready. 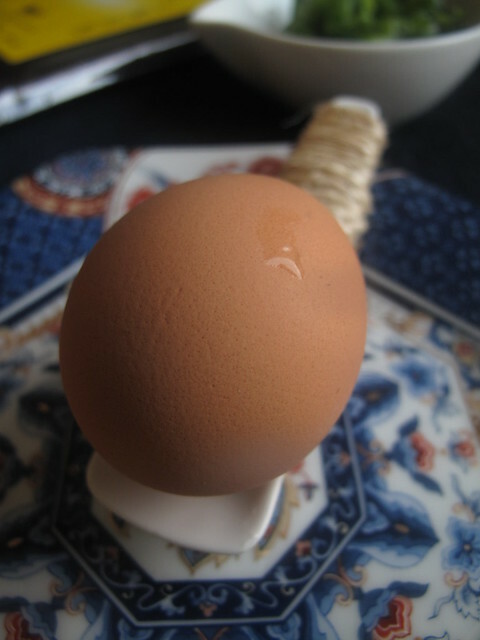 I have no time or inclination to slow-poach any eggs – even with pleasing from the house guest. Soft boiled is what I do. 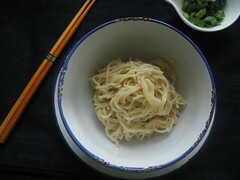 Plating begins with the noodles, then the broth. 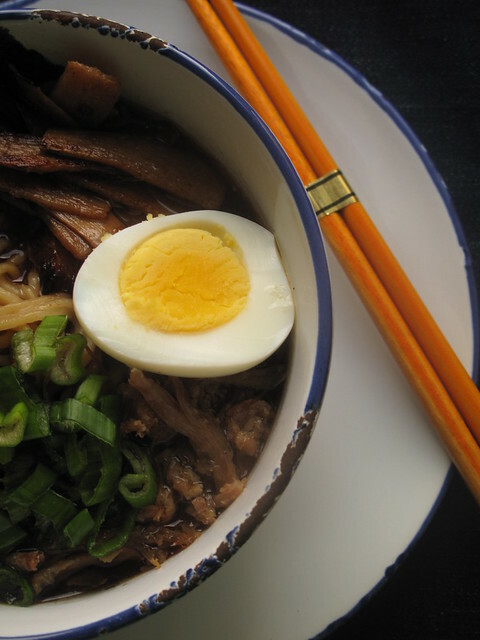 Pulled pork, pork belly and soft boiled eggs go on top as a nori square is tucked in. 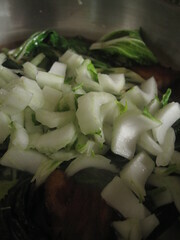 I finish with spring onions and lunch is served. Our house guest cannot stop taking photos on her Blackberry…photos of the one-week soup. I let her. She wants a photo of me too with a bowl – whether to mock my stupidity or to laud my efforts, I’m clueless. She has a steaming portion, as does my husband. They both say it is a wonderful lunch. Content. She thinks it is worth it, this bowl but it needs a touch of heat. I pull out my chilli sauce, shake it up with some broth to lighten it and hand it over. When I sit to eat my portion, I agree that it is nice. 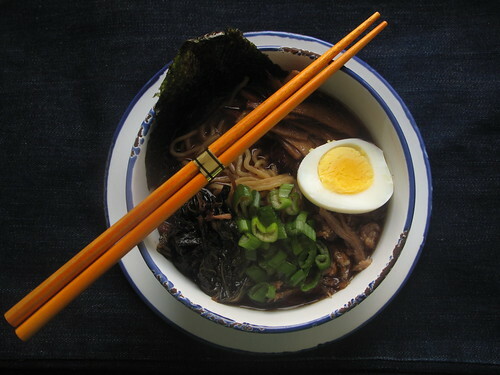 The broth is hot, steaming and full of umami flavours. I get some bitterness, slight but there – maybe from the over caramelized taré, maybe from rapid boiling of the konbu. 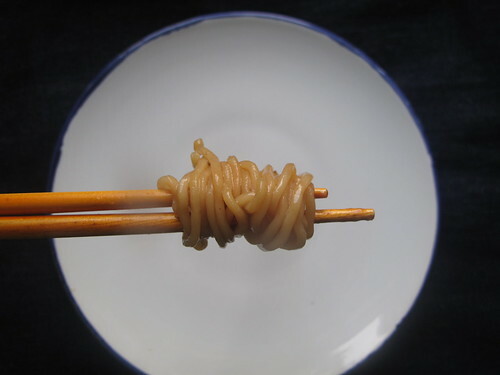 I take a bite of the toothsome noodles – you definitely want tocook and eat them “katamen” (or al dente if you’re Italiano). 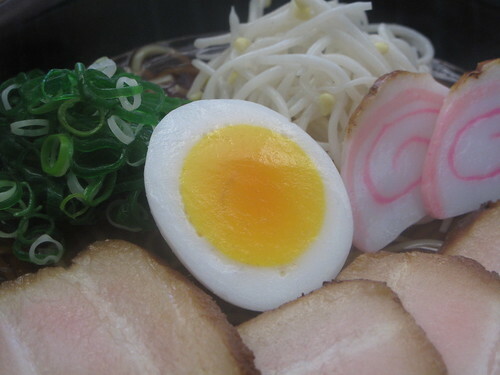 I enjoy the boiled egg, the pulled pork, the now soft nori and the freshness of the spring onions. It is the pork belly though that is the star for me – my word, the flavours are there…..they remind me of how perfect spare ribs are. I enjoy the stop so much that I go to bed thinking of Japan. Mochi. Sushi and other sophisticated culinary delights of Asia. 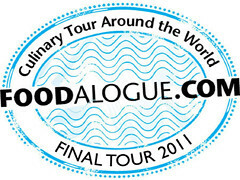 Join us on the next stop of the 2011 Culinary Tour hosted by Joan of Foodalogue. Peace and love. Tomorrow, Wednesday Joan will present a round-up of what other bloggers cooked up. Please stop by Foodalogue tomorrow. January 16 • Alaska – travelled.